Are you looking for new air conditioning or for a replacement for your old system? With the summer waves still hitting Adelaide, many home owners are now taking steps to install or upgrade their home heating and cooling. Which air conditioning model should you purchase? Which system is more affordable or more durable for the long term. The first thing you should consider are your personal heating and cooling objectives for your home. This is an obvious place to start. You should check your home floor plans to determine which type and size of air conditioning you will require. Depending on your home layout and size, a certain types of air conditioning may be more suitable than others. For instance, if you have a larger home with many rooms, a ducted reverse cycle or ducted evaporative air conditioner will work well. Ducted systems use a network of ducts and air vents to distribute conditioned air throughout a home. These ducts are very versatile and can be easily run into the roof and wall spaces of a home, and cover multiple storeys of a home. For this reason, ducted air conditioning suits larger homes with more rooms, as you can run the ducted into each room easily. Ducted air conditioning can cover harder to reach spaces in a large home, much better than if a split system air conditioner was used. Conversely, a split system would work well in a single storey standard size home with an average of 2-3 bedrooms. A wall unit can be installed into each of these rooms that require air conditioning, and powered by a single outdoor compressor. Split systems are the most conventional type of air conditioning, and very simple to install and use. It’s benefit is that you can control each wall unit independently, and not have to turn on multiple zones simultaneously (which is the case for ducted air conditioning). A lot of home owners neglect this important factor. Each household uses air conditioning differently. Some prefer to blast air conditioning throughout a home all day, while others are more frugal, turning on air conditioning on for rooms that require it. Most home owners are mindful of the cost of excessive usage, when it comes to air conditioning, and would not turn it on the whole day. They would turn on the air conditioner only to cool down or heat up a room, and then switch it off. Here’s why it is important to determine your usage pattern. Ducted air conditioning comes with an internal and external compressor unit. You could set up independent zones for each room or space in your home. This allows you to turn on or off each zone separately. However, ducted air conditioning requires both internal and external units to be turned on. Even if you are only turning on a few zones. This is why for lower consumption users, a split system would be more economical over the long run. Having said that though, recent ducted air conditioning models come with highly efficient inverter technology that significantly reduces their power consumption. This is a foremost consideration for many home owners. 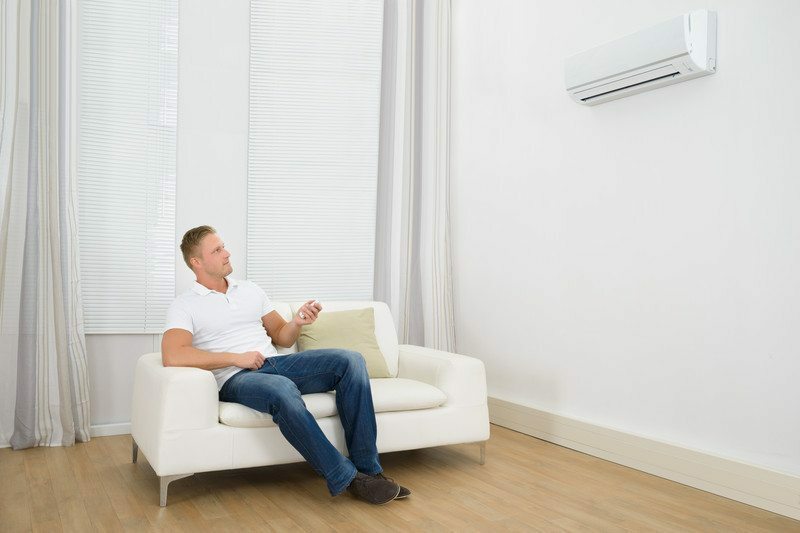 Before purchasing your air conditioner, you should definitely consider how much you can fork out – both in terms of upfront costs as well as running costs. For home owners with more budget, a ducted reverse cycle air conditioner will be ideal for most home environments. Although they consume slightly more power, they are a great convenience and is aesthetically pleasing, with a minimalist design. Zoning allows you to set up individual climate conditions for each zone, and remotely control these using the wifi app or provided zone controllers. If you have separate heating, you could also go for a ducted evaporative system. Evaporative Cooling has the lowest running cost, almost 1/10 that of a reverse cycle air conditioner. Since they use the natural process of evaporation to cool the room, very little power is required as opposed to a refrigerated system (ie. Ducted Reverse Cycle or Split System). You could literally leave your evaporative system on the whole day and still not consume as much power as a moderately used ducted or split system. Another benefit of evaporative is that you can leave your house doors and windows open as it runs. This maintains a very fresh and cool atmosphere within your home. If budget is indeed a concern, and you have a standard size home, a split system might be your ideal choice. Not every space needs air conditioning in a home. Fact is. three quarters of the year is cool. So you could just install a wall unit into a few rooms or spaces, and turn those on when you need them. An entire family could spend time in the living room with just one wall unit turned on. So, it is imperative that you consider your usage pattern. It can save you a lot of money. To get more advice on which air conditioning model suits your home, contact Jim’s Heating and Cooling at 131 546. Our expert installers will review your floor plans and suggest the best approach to your home heating and cooling needs.